Wally's Spot is a family-owned restaurant that has been a Green Bay landmark for over five decades. They offer a wide variety of menu choices that are sure to please. Wally's serves a lunch buffet Monday through Thursday and a fish fry Friday nights. I went to dine out at Wally's Spot Supper Club which is located on the far east side of Green Bay. They have a nice outside patio facing the street with wrought iron tables sets, linen tablecloths, large colorful flowers arranged throughout, and a large fresh water fountain in the center of the patio which leads off into the bar lounge area. 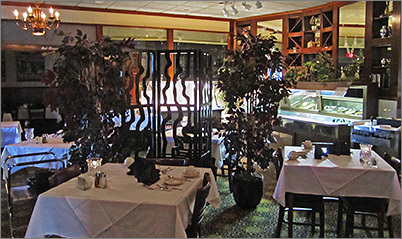 As you walk inside the restaurant from the side entrance there is a very large oval shaped bar with a table set up towards the side with complimentary appetizers including a large fresh vegetable tray, a large basket of assorted crackers, a large bowl of dried seasoned toast slices with different spreads of ham salad, liverwurst, white herb cheese, and a vegetable dip. The dining area is partially portioned off to the right side of the bar and is attractively decorated in a black and white theme, with white tablecloths and black linens with lit crystal votive candles placed on all the tables. The atmosphere is cozy and warm. It was an early Sunday evening and as I walked in the bartender greeted me in a friendly manner and brought me to my table with a menu and informed the server that she had a customer. Although it took a while for the server to come out to my table, she was very friendly and asked for my cocktail order and then later brought me a glass of ice water. She informed me of the complimentary appetizers and then asked me if I was ready to order. Wally's Spot has a very large and diverse menu. I decided on the Nova Scotia scallops for $21.95. The scallops have your choice of preparation: sauteed, broiled, or deep fried, I chose broiled. The dinner also includes your choice of Caesar salad or salad bar, I chose the Caesar salad, and a choice of French onion soup or chicken noodle soup, I chose the chicken noodle soup. In addition homemade bread, the vegetable of the day which was asparagus, and a choice of potato: mashed, baked, hash browns, or for an extra $1.50 twice baked, I chose the hash browns. 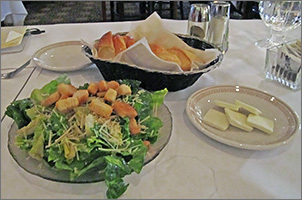 Next I was brought out a linen lined basket of warm sliced white bread with melted butter brushed on top with a plate of butter patties and my Caesar salad. The bread was very good; it was warm and fresh and the salad was also very fresh. It was mixed with a delicious dressing with fresh large croutons and freshly grated parmesan cheese on top. 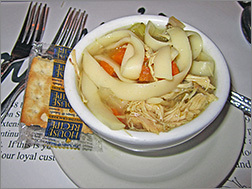 Next came my cup of chicken noodle soup; it was chock full of shredded chicken breast meat, noodles, carrot pieces, and celery pieces. It was made in house, but was on the salty side. Lastly the side of hash browns and the main entree of scallops arrived. 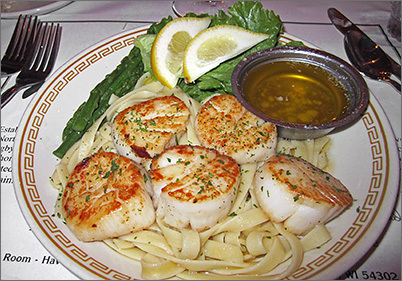 The hash browns looked very appetizing on a large side plate and the scallops were attractively presented over a bed of buttered linguine and a side of melted butter with lemon wedges. The hash browns tasted great. They were browned on the outside and very moist. The broiled scallops were spot on perfect, lightly browned, moist, and flavorful. I was very impressed with the portions and all the sides that were included with the Wally's Spot dinners. My server was friendly but she took too long to acknowledge me for I was her first and only customer. It also took too long for her to come back to the table in between courses, for I could hear her talking in the back with her co-workers. Also my water glass was never replenished and while I was waiting for my receipt two new patrons arrived and were seated next to me. They had a different server who explained three of their specials for that evening and the prices. I was disappointed to learn that not only was I never informed of the specials I was never asked if I would like to hear them. The atmosphere and food at Wally's Spot was wonderful, but the server I had that evening was less than professional.